The Pencil Cholla is a member of the Cactus Family. It is a shrubby cactus which can grow to 9 feet in height and has many cylindrical, smooth, jointed sections which are up to 6 inches in length and 0.5 inches in diameter. The plant typically grows in the southern portions of Arizona in sandy plains and washes at elevations between 1000 - 3000 feet. 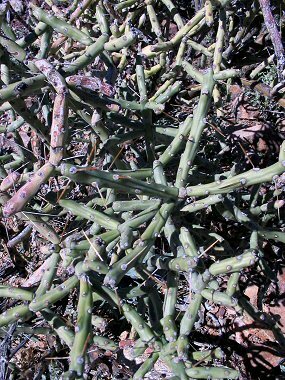 The Pencil Cholla gets its name from the many narrow jointed segments which comprise the cactus. The Pencil Cholla typically blooms between May - June and produces yellow, greenish or brown flowers to 1 inch in length, followed by a spineless red tinged fruit to 1.5 inches in length.